"Not Long 2 Go", also professionally known as Chris and Susie of "Earthbound", a pop and country singing duo, have entertained thousands upon thousands of guests and travelers at Don Laughlin’s Riverside Resort Hotel and Casino near Las Vegas, Nevada for over 21 years. Chris was born July, 1950 in Long Beach, California. Chris was a front man for rock bands most of his life and a song writer from the early 60’s on. In 1974 he released a rock album with a group called “Starfire” and helped produce and write the recorded songs. He was a frequent National Anthem singer for the Los Angeles Dodgers as well as the Los Angeles Clippers Basketball Team. Chris is also an author of two books, (one a self-help book and the other a science fiction thriller), and the inventor of six U.S. Patented helpful household products that have sold Nationwide. Susie was born February, 1958 in Hamburg, Germany and became a naturalized U.S. Citizen in 1974. Susie played violin in her high school orchestra and switched to playing the guitar when she married Chris in 1979. They soon formed a band called the “Blue Star Bandits” in California until 1995 at which time they both broke from the band to go on as a singing duo. At the time she also accompanied Chris with his books and inventions handling the internet and bookkeeping end of the business. 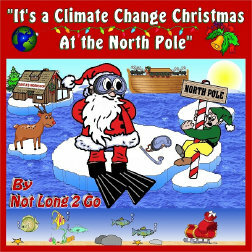 While the controversial battle over global warming still continues worldwide, Chris and Susie found that one of the ways to focus on that subject matter would be through a novelty song called “It’s a Climate Change Christmas at the North Pole” in the hope of spreading a little more awareness with a little bit of humor for everyone to enjoy, young and old. At present, Chris and Susie aka “Not Long 2 Go” are working on a compilation of novelty songs to complete their album in hopes of touching people’s hearts with humor regarding everyday events, life itself, things that we like to do, must do and wish we wouldn't have to!